Don says this line in the very first episode of Mad Men, and this is crux of advertising. Ad agencies that create innovative campaigns around their consumers happiness come out on top. Below I’ve mentioned 3 ad agencies that are not just winning a plethora of awards for their extraordinary campaigns but also the hearts of their consumers. Won Agency of the Year 13 times in the last 11 years. 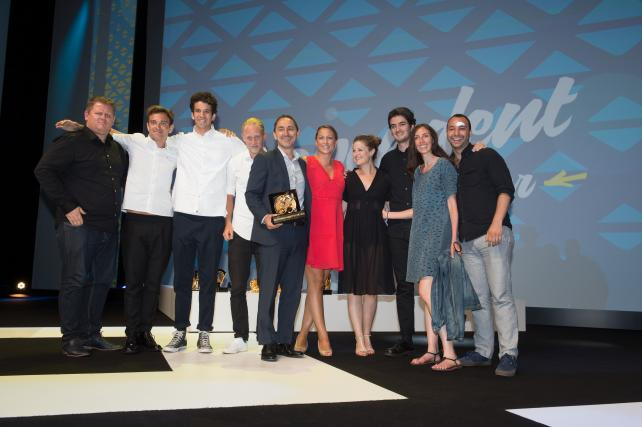 Only agency to be named to Advertising Age’s A-List for over seven consecutive years. Adweek's U.S. Agency of the Year for 2016. Suffice it to say, Droga5 has been making pretty crazy waves in the digital world since their advent in 2006. Droga5 is an advertising agency. Sounds pretty simple, and common, right? After all, every other day a new ad agency pops up ready to make a mark on this chaotic digital world. However, this ad agency has created some of the most popular, and highly creative video campaigns for brands we all know and love. They attribute most of their success to innovation; constantly evolving their advertising strategies and thinking completely out-of-the-box. Secret behind their stupendous success? This insurance giant approached Droga5 and put their creativity to test. Droga5 accepted the challenge, and created a highly popular campaign called ‘Day one’. It revolved around people who had recently retired and how they felt like to wake up on first day of their work free life. It was eye-opening, heart-warming and proved that video campaigns in the financial services niche can be extremely powerful and humane, too. "Throughout this generation, there is a hope and a belief that they will make it through. They will be OK," say the campaign's press materials. Droga 5 was given a difficult task of ‘creating an empowering and beautiful space for Under Armour Women’s brand to grow.’ And that’s exactly what they did through this amazing video bursting with raw passion. In all their campaigns, you’ll notice they don't shy away from exploring subjects and ideas that are unusual, while still staying true to the brand’s core principals and their audience. And this is what gives them an edge over all others. A team with over 35000 people spread across 5 continents and 24 time zones, Carat is a full service, award-winning, and a pretty darn awesome ad agency. They take a holistic approach with their strategies; taking care of planning, optimization, online and offline media buying, strategic consulting, development and support of integrated communication strategies. Their secret? Strategic planning through potent power of data and a healthy dash of innovation. Richard Neill wrote a highly viral post, with over 20k likes, about being mis-sold on the concept on menstruation by Bodyform over the years. This UK maxi pad brand responded him by releasing a hilarious, tongue-in-cheek video, ‘The truth’. It clocked over 3 millions views in just the first week. Using humour and harnessing a highly popular post, Carat teamed up with Bodyform to create an unconventional, bold, and amusing video. Carat created ‘Supercolor Live’ - a live event in London featuring Pharrel William and bursts of vibrant colors - to launch their Supercolor collection. Started 20 years ago, Mindshare is one of the most successful (and creative) media and marketing agencies in the world. It has over 7,000 employees, in 116 offices across 86 countries. They’re a pretty big deal. Facebook, Unilever, Mastercard, Ford. Mindshare has created winning campaigns for all these big names and so many more. How do they fight digital noise and make sure their campaigns stand out from the crowd? By assessing the niche market, coming up with bold ideas and challenging the status quo. They’re famous for keeping their finger on the pulse of new media. Women are often discouraged to participate in sports as it’s supposed to decrease their physical attractiveness. 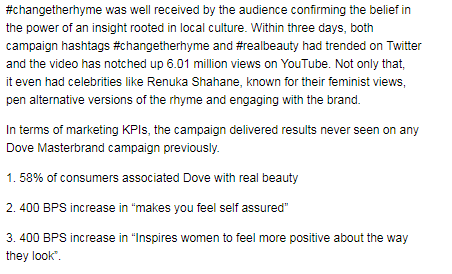 After gathering data, Mindshare partnered with Dove to create a powerful video that challenges all these beauty ideals and more. Result? Lots and lots of applause. Marks and Spencer’s most customer-centric campaign till yet is ‘Love Mrs Claus’. With women lamenting the the lack of female role models, Mindshare decided to reconnect M&S with their lost female oriented audience through this campaign. Was hailed the best Christmas campaign by Evening Standard, Sun, Daily Mail, Express and Metro. The Telegraph declared that ‘In a bid to help 2016 come to a less crashing end for women, M&S have saved the day with their Christmas offering’.